Renowned golf coach Bob Torrance, the father of Ryder Cup-winning captain Sam, has died aged 82. Torrance helped Irishman Padraig Harrington win back-to-back Open titles in 2007 and 2008. His son Sam, who captained Europe to Ryder Cup success in 2002, tweeted: "Sad day - my dad just passed away peacefully in his sleep." Torrance senior, called "the greatest golf coach in the world" by Harrington, had been battling cancer. "My majors would never have happened without Bob," said Harrington. "Not a chance. "He was a father figure to me after my own dad passed away." Iain Carter, BBC Sport's golf correspondent, tweeted: "Saddened to hear of the death of one of golf's great gentlemen and a wonderful teacher, Bob Torrance. Thoughts with June & Sam." Ian Poulter, playing in the Open, added: "Really sad news Bob Torrance just passed away. An amazing man who coached so many great players. He will be missed." Marc Warren, a former pupil Torrance claimed was more concerned with "big flats and Aston Martins" than developing his game, also paid tribute. The 33-year-old said: "It is a sad day for golf, a legend has passed away. It is a sad day for everyone involved. "He gave you absolutely everything he had to make you the best player you could possibly be. I will forever be in his debt for that." 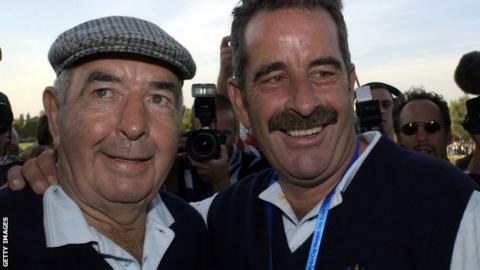 European Ryder Cup captain Paul McGinley, who was coached by Torrance for over 20 years, said: "This is an incredibly sad day as we have lost one of life's, as well as one of golf's, really true characters. "I feel blessed to have known Bob for many years and to have had him as my coach since 1992. "Not only was he a world class golf coach, a fact recognised right across the game, but he was also one of my very favourite people in life. I will dearly miss his teaching and his wit."